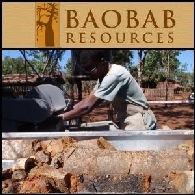 Baobab Resources (LON:BAO) Confirms Product Quality following the successful pyrometallurgical test work campaign completed during the Pre-Feasibility Study. The Company has completed a second round of bench-scale beneficiation with reduction and smelting tests of oxidised iron ore that again demonstrates that a low impurity pig iron product can be achieved. BRR Media interviews Baobab Resources (LON:BAO) MD Ben James following the release of the Tenge Measured Resource statement. 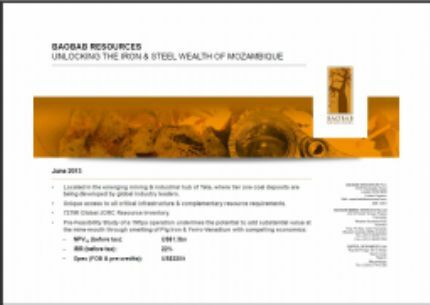 Baobab Resources Plc (LON:BAO), the Mozambique focused resource development company, is pleased to provide the following summary of the Measured resource estimation of the Tenge resource block at the Company&apos;s 85% owned Tete pig iron and ferro-vanadium project (the &apos;Tete Project&apos;) in which International Finance Corporation (&apos;IFC&apos;) hold a 15% participatory interest. 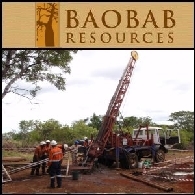 Baobab Resources plc (LON:BAO) the iron ore, base and precious metals explorer with a portfolio of exploration projects in Mozambique, is pleased to announce its Interim Results for the six months ended 31 December 2013. 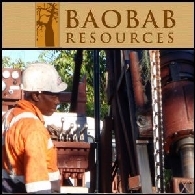 Baobab Resources Plc (LON:BAO) is pleased to provide the following update on initial drill results relating to the measured resource estimation of the Tenge resource block at the Company&apos;s Tete pig iron and ferro-vanadium operation in Mozambique. 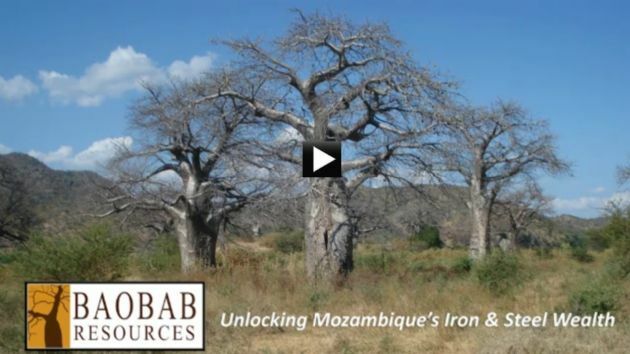 Baobab Resources Plc (LON:BAO) (&apos;Baobab&apos; or the &apos;Company&apos;) is pleased to provide the following update on activities relating to the Bankable Feasibility Study (&apos;BFS&apos;) at the Company&apos;s Tete pig iron and ferro-vanadium operation in Mozambique. This Thursday, 5th December , there are two opportunities to see Ben James, MD of Baobab Resources, updating the markets with the Company&apos;s latest news and what to expect in 2014. 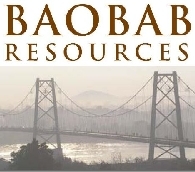 Baobab Resources Plc (LON:BAO) (&apos;Baobab&apos; or the &apos;Company&apos;) is wholly focused in Mozambique where it is developing a pig iron and ferro-vanadium project in the Tete province (the &apos;Tete Project&apos;), one of Africa&apos;s fastest growing mining centres. Other assets in the Company&apos;s portfolio include the Changara project which is being operated under a Joint Venture (&apos;JV&apos;) with ASX listed Metals of Africa (please refer to RNS dated 28 November 2012). 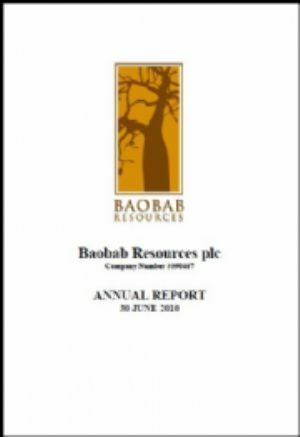 Baobab Resources Plc (LON:BAO) (&apos;Baobab&apos; or the &apos;Company&apos;) is pleased to provide further information regarding the recently discovered sequence of carbonate rocks located within 5km of the Company&apos;s Tenge/Ruoni resource block and proposed pig iron and ferro-vanadium operation. Baobab Resources (LON:BAO) Managing Director, Ben James, discusses the operational update announcement and the implications of the Memorandum of Understanding (MOU) with Mozambique&apos;s national power utility.